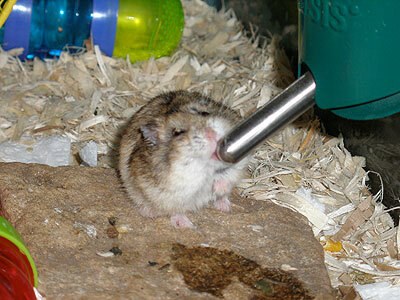 Diabetes is becoming a common problem in Campbell's hamsters and is an inherited problem. Unless an individual hamster's ancestry is known to be free of the illness, a Campbell's dwarf should not be fed any sugary foods (including fruit, corn, peas, carrots, yogurt drops, and some mass-manufactured "treats"). You may find other websites or books that mention providing fruit to a Campbell's Russian Dwarf Hamster as a treat is fine, but with the potential for diabetes and to prolong the life of your hamster, avoid all sweet snacks. Try a carrot instead. Be sure to remove any uneaten vegetables to prevent spoiled food from accumulating in your hamster's cage. Besides carrots try a high-quality dog biscuit as another type of snack or treat. Like all hamsters, Campbell's dwarfs are rodents and therefore must gnaw regularly to keep the incisors from growing into the skin of the mouth and causing health problems. Dog biscuits can help with the incisors as well along with being a healthy snack. Wooden chew toys should not be used with dwarf hamsters since there is a possibility of injury from a splinter. Teeth should be examined regularly to ensure they are not growing unchecked.